The club were represented by a record number of our juniors at this years schools inter counties championship event, the Mason Trophy. Representing Staffordshire they were competing against the top athletes from, Cheshire, Derbyshire, Greater Manchester, Hereford & Worcester, Northants, Nottinghamshire, Shropshire, Warwickshire and West Midlands. 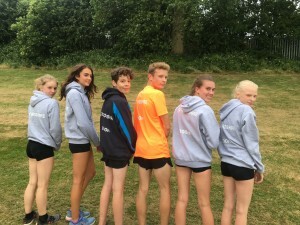 6 of our athletes in the Intermediate Girls and Boys age group were selected following their performances at last weeks schools county championships (4 of those are in their first year in the age group so it bodes well for next year!). On a blustery day at the Alexandra Stadium, Birmingham their were fine performances all round and some very large PB’s too! Staffs Athletes – Misha, Scarlett, Elliot, Lewis, Nadine and Lizzie. 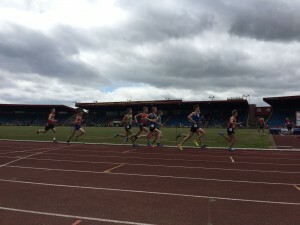 In the Intermediate Boys 3000m Elliot Smith made his Staffs track debut and was rewarded with a new PB of 10:53.56 mins knocking 27 seconds of the time he set last weekend. Elliot finished in 14th position. 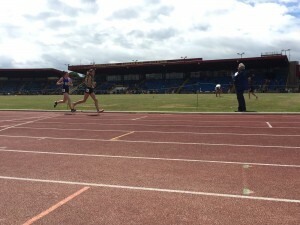 In the Intermediate Girls 3000m Nadine Tomkinson finished in 10th position, gaining her first Staffs Schools track vest, recording a time of 11:33.85 mins and knocking 25 seconds off her time from last week (and 1:16 since the start of the season!). 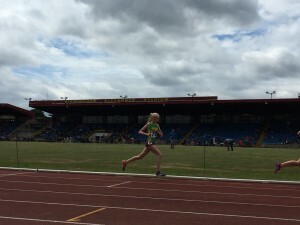 In the Intermediate Girls 1500m Elizabeth Clarkson represented the county for the second consecutive season and finished in 13th in 5:11.91 mins, missing out on a PB by just 4 seconds. 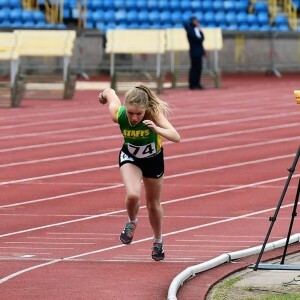 Also making her track debut in the Intermediate Girls 800m Misha Twardochleb finished in 15th place, she couldn’t quite gain another PB this week and finished just 3 seconds off in 2:36.08 mins. 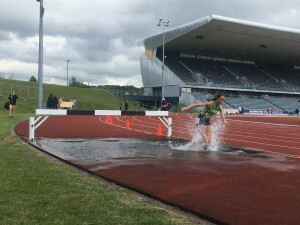 In the Intermediate Girls 1500m Steeplechase Staffs debutant Scarlett Cotton knocked a massive 31 seconds off the time she set last weekend when winning the county championships. Scarlett finished in 5th position in a new PB of 6:06.53 mins. 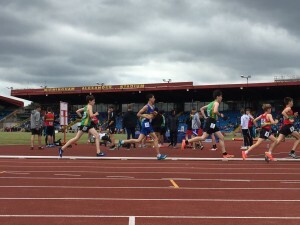 In the Intermediate Boys 1500m Lewis Nagington represented the county on the track for the first time and narrowly missed his PB by just half a second recording a time of 4:18.12 mins finishing in 10th position. Congratulations to all six of our junior athletes.